Depending on ballast used (including water, sand, steel, or combinations), operating weight of the CW16 varies from an 11,464-pound (5,200-kg) base configuration to an approximate maximum weight of 33,000 pounds (15,000 kg) for the nine-wheel configuration and 32,850 pounds (14,900 kg) for the 11-wheel configuration. Operating weight can be adjusted to suit job requirements. Per-wheel weight can be varied from 1,280 pounds (580 kg) to 3,680 pounds (1,670 kg) for the nine-wheel model and from 1,060 pounds (480 kg) to 2,975 pounds (1,350 kg) for the 11-wheel model. 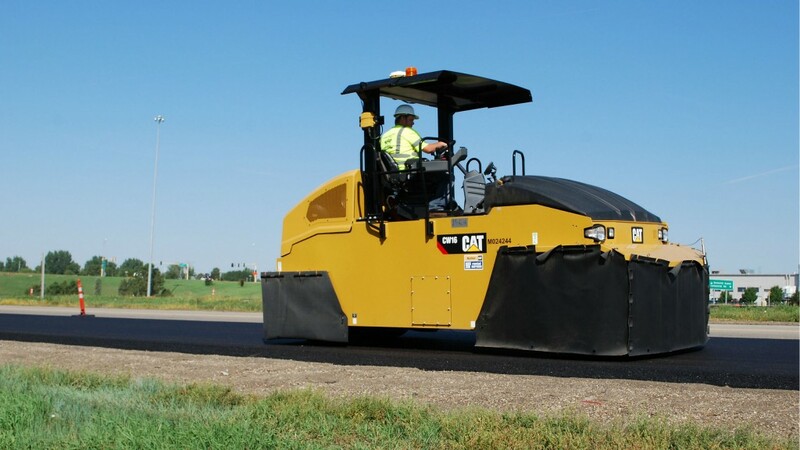 Oscillating front wheels assist in compacting soft voids across the entire machine width, and the 11-wheel configuration increases efficiency in chip-and-seal applications. A tire overlap of 1.25 inches (32 mm) ensures even compaction across the surface. Each wheel is equipped with self-adjusting scrapers, and a water-spray system deters material from adhering to the wheel surface. Standard cocoa mats help retain water to keep wheels wet, and heat-retention aprons are available. Two engines are available for the CW16 to meet regional emissions requirements. The Cat C3.4B ACERT engine meets U.S. EPA Tier 4 Final/EU Stage IV standards, and the Cat C4.4 meets the equivalent of U.S. EPA Tier 3/EU Stage IIIA/China NR III standards. An Eco-mode, in combination with an exclusive automatic speed-control system, is designed to save fuel, lower sound levels, and deliver smooth transitions for optimum mat quality. Both engines are rated at 101.9 hp (75 kW).